At least 25 people died in a fire at a high-rise office building in Dhaka, Bangladesh, Thursday — and officials say the building didn't have the right safety protocols in place. The high-rise building where fire and smoke killed 25 people in Dhaka, Bangladesh's capital, did not have a proper fire suppression system — and some of its emergency exit doors were locked, officials say. A criminal case is being pursued against the building's owners. 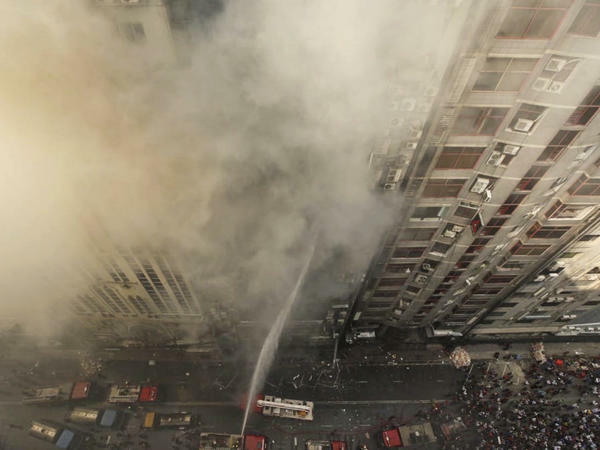 The death toll rose sharply after firefighters brought the fire inside the 22-story FR Tower under control Thursday afternoon and were able to search the office building in Dhaka's Banani area. Fire and safety officials in Dhaka say the building had numerous problems that presented safety flaws. Office workers and others inside the tower were trapped. Dozens of people were injured. Information Minister Hasan Mahmud alleged on Friday that because of the building's condition, innocent people were killed not by the fire but by the owners' greed. He added that the building had been built with more stories than were initially approved. "We found many emergency exit points of the FR Tower were just eyewash," Saleh Uddin, assistant director of fire service and civil defense, tells The Daily Star. "No demonstration on how to use emergency exit points of the building was held ever, and those were kept locked on different floors. As a result, the trapped people could not come out of the building using the emergency exits." Of the fatalities, Uddin said, about a fifth were from falls, as people either jumped to their deaths or fell while trying to climb to safety. The FR Tower fire comes one month after another large fire killed at least 70 people in a different district of Dhaka. Horrific fires have become a tragic recurring theme in Bangladesh, with lax safety rules and substandard construction often taking a large part of the blame. In 2012, a fire at a garment factory killed 112 workers, setting off an uproar and triggering homicide charges against the factory's owners. The large fire in Banani Thursday set off a panic inside the building; outside, it also drew a massive crowd of people who could only look on in horror as fire rescue teams using ladder trucks and helicopters struggled to save people. After growing increasingly desperate, some of those inside tried to scramble down cables on the side of the building. Others yelled out the windows for help, or used social media to plead with firefighters to reach them. After visiting the fire-ravaged building on Friday, Public Works and Housing Minister Rezaul Karim told reporters, "I believe that the incident was down to negligence. This wasn't an accident, it's murder." Authorities say fewer people would have died if the building had followed safety standards, including having wide staircases that are protected from smoke and flames. "When examining the building after the fire, we found that many fire safety measures were not in place," Lt. Col. Julfiqur Rahman of the Bangladesh Fire Service and Civil Defence told the Dhaka Tribune. "The staircases leading out of the building were extremely cramped. Furthermore, the security gates of some of the offices in the building were locked."